A great way to get all the great taste and performance of Muscle Milk® with half the fat and significantly less calories! Muscle Milk Light delivers the same nutrition-rich, flavor-packed indulgence of Muscle Milk, but with 50% less fat and 35% fewer calories. So why make a light version? Because there is no such thing as a one-size-fits-all body. The athlete training for tennis season needs more sustained energy than the athlete training for beach season. Muscle Milk Light is specifically designed for individuals who want to maximize lean muscle gains while reducing caloric intake to help with weight management. The functional fats in Muscle Milk Light are trans-fat free and are used as a source of energy, not stored as fat. The complex carbohydrates in Muscle Milk Light help maintain healthy blood sugar levels and are a preferred source of our exercising muscles. Muscle Milk light provides the same ultra-premium, sustained release protein blend consisting of Micellar Caseins & Whey for sustained energy throughout the day. 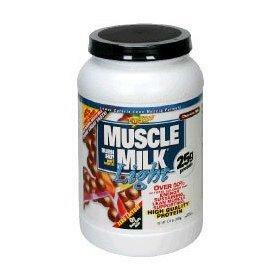 *comparison based on per serving of original Muscle Milk powder to Muscle Milk Light powder. Lighter Blend: 50% less fat and 35% fewer calories per serving. Complete Protein Blend: 25 grams of an ultra-premium protein blend. More complete than Whey alone for prolonged protein supplied energy. Rich in highly anti-catabolic Micellar Caseins. Functional Fats: Medium-Chain Triglycerides (MCT's) are more likely burned for muscle energy and heat than stored as fat. Muscle Repair: Abundant in L-Glutamine and fortified with Glutamine Peptides to boost muscle recovery and immunity. Right Blend of Carbs: Complex Carbohydrate blend to help prevent blood sugar letdown and sustained energy. Amazing Taste: Same flavor indulgence that you expect! Order Muscle Milk Light Now!